Humanitarian organizations are in a state of “continuous crisis” with thousands fleeing Iraq’s second-biggest city of Mosul daily, as the government offensive, backed by a US-led coalition air force, reaches its decisive stage. “Civilians are fleeing en-masse and they are telling us that they are terrified – of both what they face at the hands of ISIS, but also the bombs from the air strikes that fall on their heads,” Elisabeth Koek, Advocacy and Information Adviser at the Norwegian Refugee Council (NRC) in Iraq, told RT from Erbil, the capital of Iraqi Kurdistan. On Friday, Iraqi authorities reported that 14,000 fled Western Mosul in a single day – the biggest outflow since the offensive began last October. On Saturday, another 8,000 were reported to have escaped from the city, which has been under Islamic State (IS, formerly ISIS/ISIL) control since 2014. Despite highly publicized concerns from NGOs that the mostly Shia incoming army could mete out severe treatment to the mostly Sunni Mosul population, but Koek says that so far, escapees have been treated humanely. There's particular concern for the men amongst them who could be suspected of being Islamic State sympathizers. 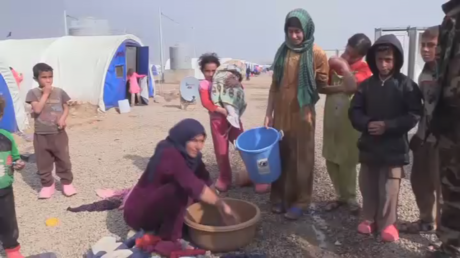 But with all major roads out of the city now cut off, the situation grows increasingly dire, with many residents – mostly women and children – risk being caught in the literal crossfire, as they venture out of the city and towards the Iraqi frontline. “What we are struggling with is the copious numbers of people who are fleeing but also the state they are in. Not only are people terrified and exhausted when they reach us, but they haven’t had a proper supply of food, water, and basic medicines for weeks, possibly months,” said Koek. With the remaining Islamic State units retreating deeper into the historic heart of the city, street-by-street fighting is imminent. Winning the battle is likely to take weeks or even months, while hundreds of thousands of civilians remain trapped inside.